As more and more newspaper archives become available online in digital format, more “mysteries” in our family histories will be solved. My recent experience occurred while “surfing” the growing collection of newspapers at Ancestry.com. An “unknown” photo now has a name and story too. After the death of my great-great grandmother at the age of 30 from “consumption”, my great-great grandfather remarried and had a second family of four more children. The oldest was born in 1863 in Grafton, Taylor County, Virginia (West Virginia after June 20, 1863). 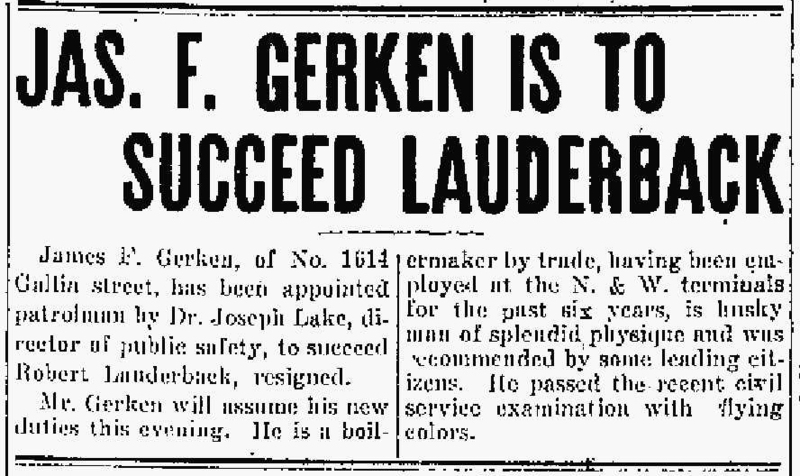 James Francis Gerken grew up in Grafton, moving to Parkersburg as a young man to work for the Baltimore and Ohio Railroad as a boilermaker. He married, and had four children of his own. About 1908 he moved to Portsmouth, Scioto County, Ohio, where he worked as a boilermaker in the shops of the Norfolk & Western Railway. A cousin from this side of the family had provided me with more than 100 photos he found while cleaning out his mother’s home after her death. Some were labelled. Many were not. 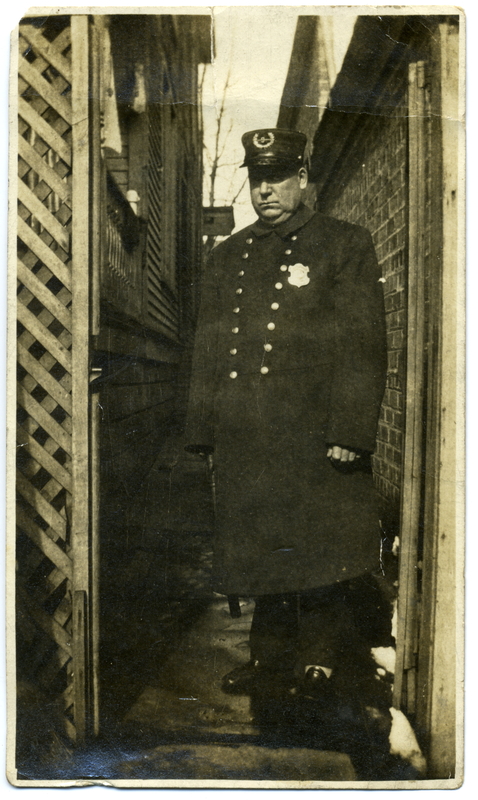 One interesting photo showed a burly gentleman in a police uniform. No name, no date, no location. Interesting, but lost to time. My half great great uncle’s story continues to unfold for me. Born in my dad’s hometown, employed in the same trade for the same railroad as my grandfather, married in a church in my hometown, and now this photo rejoined to his life’s history by “chance” – fortune does favor the prepared mind. When it comes to family history “stuff”, I collect everything. Photos are especially appealing, having a life of their own with a story to tell. And the stories continue to unfold if only we will listen, and remember.